I wish I had a camera. On a cold December evening, as I was walking down Colorado Blvd, downtown Pasadena, I couldn’t help but notice a pale and thin looking man with sunken eyes. He was probably in his 40s but he looked like he was in his 60s. My eyes caught the markings all over his body. This is something that has always perplexed me. What in the world is the reason why some people put tattoos on their skins? This man’s tattoos are different. Almost all of his body is covered with it. His forehead, neck and arms have all kinds of designs and skulls and other symbols only he understands. I can almost guess that all other parts of his body are covered, too. However, as I was looking at him, one word tattooed on his right arm caught my attention. It was the word LOVE. It was tempting to ask him why he had written that word. In the midst of all the confusing marks on his skin, love stood out. Did he get the tattoo because he was then in love? Was it something he had put so he is reminded of the power of love? 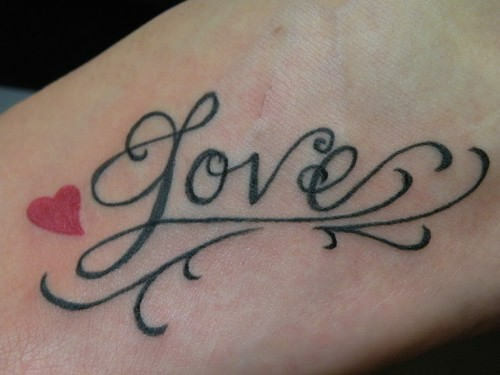 Did he think that if he writes LOVE with his arm, he will be a loving man? I don’t know. My guess is as good as yours. However, my point is that I did see the word and it stood out. Should I do the same? I know that it is common for people to decorate their homes with beautiful quotes of wisdom and even a biblical verse. Does putting a tattoo on our bodies or a decoration at home present who we really are? As I meditate about it, I came to realize that all of us write things everyday with our arms in much less pronounced ways. We may not have a “love” tattoo, but we do write love with our arms when we comfort a sobbing friend, hugging them with love and compassion. We write love with our arms when we get our hands dirty doing volunteer work cleaning up streets and parks. We write love with our arms when we are holding a big spoon stirring up pots of boiling chicken soup and serving them using large Styrofoam cups to homeless friends who have nowhere else to turn for food. We write love with our arms when we swing hammers and dig holes, building and repairing houses for families who need a place to call home. Yet we write with more than our hands. We write love with our ears when we sit in hospital rooms, listening carefully to another’s story of pain, leaning towards them with eagerness to hear. We write love with our feet when we run for a cause that benefits the poor, the downtrodden and the zero of the society. We write love with our hands when we grab hold of that check and send a donation so that others may be fed and clothed. We write love with our heads when we open up the doors of learning to deserving students by supporting organizations that provide them mentoring and tutoring in schools where there are few role models. We write love with our lips when we whisper in prayer and intercede for their needs. If you agree with this, then we are a strange people. In the midst of a world marked by tattoos of confusion and terror, our testimonies of humble service, peacemaking, and simplicity, though less pronounced, yet stands out as a bold sort of love written indelibly in our hearts. The Bible tells us that even while we were living against His will, while we were living in a life of mess and confusion, yet God’s love stands out through His Son, Jesus Christ. Friends, we live in an ever-changing world, mingled with marks of selfishness and hopelessness. Our lives may not stand out as politicians and celebrities, but we can take the opportunity to have LOVE written in our hearts, though hidden, yet obvious to all who encounter us.